Overall I have been enjoying Justice League Odyssey. But I do have to admit that this issue didn’t quite grab as much as the previous ones. Still, I maintain faith in the series. Perhaps I just need some questions answered. The tease that Starfire might be, somehow, part of the New Gods was interesting, but the stakes got upped on that at the end of the last issue, as we encountered a planet where Cyborg is worshiped as a god. 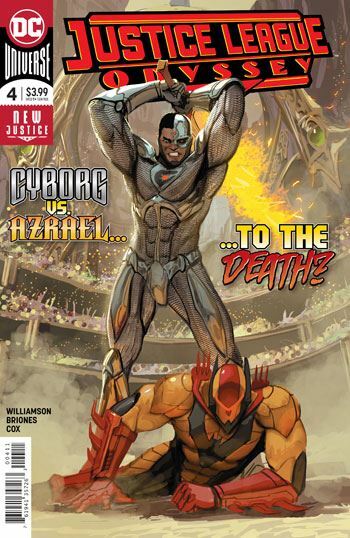 Most of this issue is set on that world, as Cyborg has to fight to prove to them that he is what they think he is, even though he is not. Been there, seen that many times before, and I suspect that is what turned me off a bit. I did like the revelation at the end, which looks to make sense of the larger situation. I was also very happy to see Blackfire brought into the story, even though her role in this issue is quite small. And although I am not sure why, even Briones’ art, which I have been enjoying, just felt not up to par on this one. Honestly, I will be curious to see other people’s reviews of this issue, to see if others shared my lack of enthusiasm on this outing. I still do recommend the series, and I still and looking forward to where it will go. I just didn’t care for this chapter too much.